This paper presents a novel wearable haptic device that provides the user with knowledge of a vertical force, measured at the fingertips, by applying pressure at three different locations on the user’s body. Human prehension and manipulation abilities rely on the ability to convert tactile information into controlled actions, such as the regulation of gripping force. Current upper-limb prosthetics are able to partially replicate the mechanical functions of the human hand, but most do not provide any sensory information to the user. This greatly affects amputees, as they must rely solely on their vision to perform grasping actions. 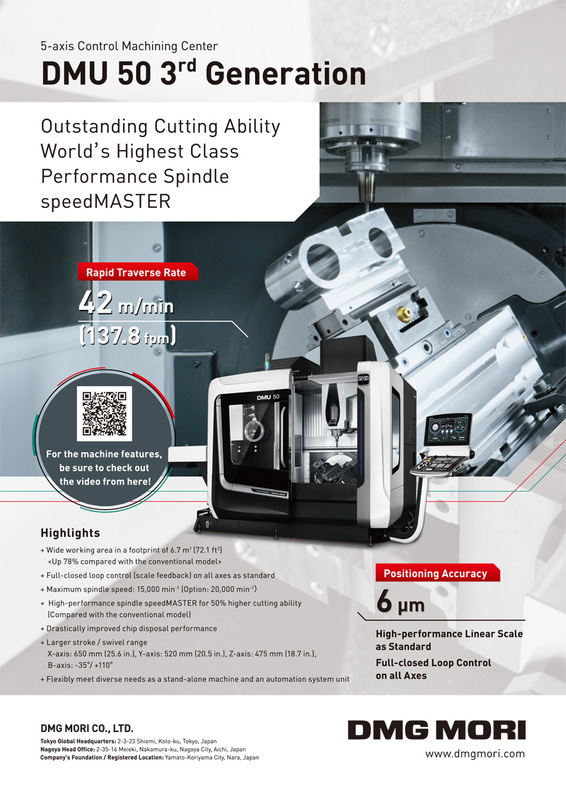 Our device uses a twisted wire actuator to convert rotational motion into linear displacement, which allows the device to remain compact and light-weight. In the past, the main shortcoming of this type of actuator was its limited linear range of motion; but with a slight modification of the principle, we have extended our actuator’s linear range of motion by 40%. In this paper, we present the design of our haptic device, the kinematic and dynamic modelling of the actuator, and the results of the experiments that were used to validate the system’s functionality. M. Motamedi, D. Florant, and V. Duchaine, “A Wearable Haptic Device Based on Twisting Wire Actuators for Feedback of Tactile Pressure Information,” J. Robot. Mechatron., Vol.27, No.4, pp. 419-429, 2015. B. Hannaford and A. Okamura, “Haptics,” B. Siciliano and O. Khatib (Eds. ), Springer Handbook of Robotics, pp. 719-739, Springer Berlin Heidelberg, 2008. A. Agovic, S. Levine, N. Papanikolopoulos, and A. Tewfik, “Haptic interface design considerations for scrub nurse robots in microsurgery,” 2010 18th Mediterranean Conf. on Control Automation (MED), pp. 1573-1578, June 2010. M. Evans, D. Wallace, D. Cheshire, and B. Sener, “An evaluation of haptic feedback modelling during industrial design practice,” Design Studies, Vol.26, No.5, pp. 487-508, 2005. C.-H. King, M. Culjat, M. Franco, C. Lewis, E. Dutson, W. Grundfest, and J. Bisley, “Tactile Feedback Induces Reduced Grasping Force in Robot-Assisted Surgery,” IEEE Trans. on Haptics, Vol.2, No.2, pp. 103-110, April 2009. H. Tanaka and K. Kushihama, “Haptic vision – vision-based haptic exploration,” Proc. 16th Int. Conf. on Pattern Recognition, Vol.2, pp. 852-855, 2002. K. Kim and J. Colgate, “Haptic Feedback Enhances Grip Force Control of sEMG-Controlled Prosthetic Hands in Targeted Reinnervation Amputees,” IEEE Trans. on Neural Systems and Rehabilitation Engineering, Vol.20, No.6, pp. 798-805, Nov. 2012. P. Srinivasa, S. Nagananda, G. Kadambi, R. Hariharan, P. Shankpal, and S. Shankapal, “Development of two degree of freedom (DoF) bionic hand for below elbow amputee,” 2013 IEEE Int. Conf. on Electronics, Computing and Communication Technologies (CONECCT), pp. 1-6, Jan. 2013. S. Takamuku, A. Fukuda, and K. Hosoda, “Repetitive grasping with anthropomorphic skin-covered hand enables robust haptic recognition,” IEEE/RSJ Int. Conf. on Intelligent Robots and Systems (IROS 2008), pp. 3212-3217, Sep. 2008. P. Galambos and P. Baranyi, “Vibrotactile force feedback for telemanipulation: Concept and applications,” 2011 2nd Int. Conf. on Cognitive Infocommunications (CogInfoCom), pp. 1-6, July 2011. J. Martinez, D. Martinez, J. Molina, P. Gonzalez, and A. Garcia, “Comparison of Force and Vibrotactile Feedback with Direct Stimulation for Texture Recognition,” 2011 Int. Conf. on Cyberworlds (CW), pp. 62-68, Oct. 2011. T. Sono, L. Menegaldo, and M. Pinotti, “Hand prosthesis prototype controlled by EMG and vibrotactile force feedback,” 5th IEEE RAS EMBS Int. Conf. on Biomedical Robotics and Biomechatronics, pp. 91-95, Aug. 2014. C. Hager-Ross, K. Cole, and R. Johansson, “Grip-force responses to unanticipated object loading: load direction reveals body- and gravity-referenced intrinsic task variables,” Experimental Brain Research, Vol.110, No.1, pp. 142-150, 1996. S. J. Lederman and R. L. Klatzky, “Haptic perception: A tutorial,” Attention, Perception, & Psychophysics, Vol.71, No.7, pp. 1439-1459, 2009. J. C. Lee, P. H. Dietz, D. Leigh, W. S. Yerazunis, and S. E. Hudson, “Haptic Pen: A Tactile Feedback Stylus for Touch Screens,” Proc. of the 17th Annual ACM Symposium on User Interface Software and Technology, UIST ’04, pp. 291-294, New York, NY, USA, 2004. D. Caldwell, N. Tsagarakis, and C. Giesler, “An integrated tactile/shear feedback array for stimulation of finger mechanoreceptor,” Proc. 1999 IEEE Int. Conf. on Robotics and Automation, Vol.1, pp. 287-292, 1999. A. M. Okamura, J. T. Dennerlein, and R. D. Howe, “Vibration feedback models for virtual environments,” Proc. 1998 IEEE Int. Conf. on Robotics and Automation, Vol.1, pp. 674-679, 1998. 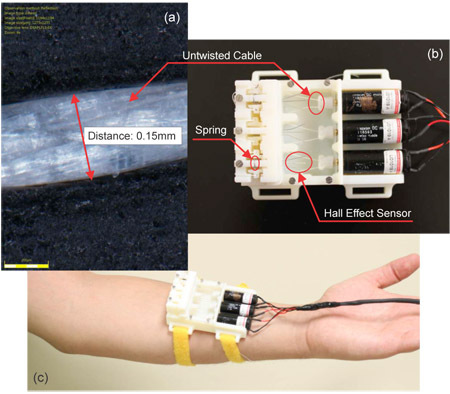 D. Damian, M. Ludersdorfer, Y. Kim, A. Hernandez Arieta, R. Pfeifer, and A. Okamura, “Wearable haptic device for cutaneous force and slip speed display,” 2012 IEEE Int. Conf. on Robotics and Automation (ICRA), pp. 1038-1043, 2012. J. Dargahi and S. Najarian, “Human tactile perception as a standard for artificial tactile sensing – a review,” The Int. J. of Medical Robotics and Computer Assisted Surgery, Vol.1, No.1, pp. 23-35, 2004. E. P. Gels, “Electroactive polymer (EAP) actuators as artificial muscles: reality, potential, and challenges,” Y. Bar-Cohen (Eds. ), SPIE, 2004. E. Smela, “Conjugated polymer actuators for biomedical applications,” Advanced Materials, Vol.15, No.6, pp. 481-494, 2003. F. Bechet and K. Ohnishi, “An experimental validation of electro-hydraulic transmission for haptic teleoperation – Comparison with thrust wire –,” 2014 IEEE 23rd Int. Symposium on Industrial Electronics (ISIE), pp. 1174-1179, June 2014. R. Fan, M. Culjat, C.-H. King, M. Franco, R. Boryk, J. Bisley, E. Dutson, and W. Grundfest, “A Haptic Feedback System for Lower-Limb Prostheses,” IEEE Trans. on Neural Systems and Rehabilitation Engineering, Vol.16, No.3, pp. 270-277, 2008. P. Berkelman, R. Hollis, and S. Salcudean, “Interacting with virtual environments using a magnetic levitation haptic interface,” Proc. 1995 IEEE/RSJ Int. Conf. on Intelligent Robots and Systems, ‘Human Robot Interaction and Cooperative Robots,’ Vol.1, pp. 117-122 1995. O. Erol and H. Gurocak, “Mr-brake with permanent magnet as passive actuator for haptics,” World Haptics Conf (WHC) 2013, pp. 413-418, April 2013. V. Duchaine and A. Rana, “Dielectric geometry for capacitive-based tactile sensor,” WO Patent App. PCT/CA2014/050,040, July 24, 2014. S. R. Kremer, “Twisted cord actuator,” US Patent 4,843,921, July 4, 1989. M. Shoham, “Twisting wire actuator,” J. of Mechanical Design, Vol.127, No.3, pp. 441-445, 2005. T. Wurtz, C. May, B. Holz, C. Natale, G. Palli, and C. Melchiorri, “The twisted string actuation system: Modeling and control,” 2010 IEEE/ASME Int. Conf. on Advanced Intelligent Mechatronics (AIM), pp. 1215-1220, 2010. S. Kawamura, W. Choe, S. Tanaka, and S. R. Pandian, “Development of an ultrahigh speed robot FALCON using wire drive system,” Proc. 1995 IEEE Int. Conf. on Robotics and Automation, Vol.1, pp. 215-220, 1995. I. Godler, K. Hashiguchi, and T. Sonoda, “Robotic finger with coupled joints: a prototype and its inverse kinematics,” 2010 11th IEEE Int. Workshop on Advanced Motion Control, pp. 337-342, 2010. T. Sonoda and I. Godler, “Multi-fingered robotic hand employing strings transmission named “Twist Drive”,” 2010 IEEE/RSJ Int. Conf. on Intelligent Robots and Systems (IROS), pp. 2733-2738, 2010. M. C. Jimenez and J. A. Fishel, “Evaluation of force, vibration and thermal tactile feedback in prosthetic limbs,” 2014 IEEE Haptics Symposium (HAPTICS), pp. 437-441, 2014. K. Kim, J. Colgate, J. Santos-Munne, A. Makhlin, and M. Peshkin, “On the Design of Miniature Haptic Devices for Upper Extremity Prosthetics,” IEEE/ASME Trans. on Mechatronics, Vol.15, No.1, pp. 27-39, Feb. 2010. M. Konyo, “Wearable haptic interface using icpf actuators for tactile feel display in response to hand movements,” J. of Robotics and Mechatronics, Vol.15, No.2, pp. 219-226, 2003. H. Tanaka, H. Kaminaga, and Y. Nakamura, “Pressure Feedback Control Based on Singular Perturbation Method of an Electro-Hydrostatic Actuator for an Exoskeletal Power-Assist System,” J. of Robotics and Mechatronics, Vol.24, No.2, pp. 354-362, 2012. M. Suzuki and A. Ichikawa, “Toward springy robot walk using Strand-muscle actuators,” Proc. 7th Int. Conf. on Climbing and Walking Robots, pp. 479-486, 2005. J.-D. Deschenes, P. Lambert, S. Perreault, N. Martel-Brisson, N. Zoso, A. Zaccarin, P. Hébert, S. Bouchard, and C. M. Gosselin, “A cable-driven parallel mechanism for capturing object appearance from multiple viewpoints,” Proc. of the Sixth Int. Conf. on 3-D Digital Imaging and Modeling (3DIM 2007), pp. 367-374, 2007. M. J.-d. Otis, T.-L. Nguyen-Dang, T. Laliberté, D. Ouellet, D. Laurendeau, and C. Gosselin, “Cable tension control and analysis of reel transparency for 6-dof haptic foot platform on a cable-driven locomotion interface,” Int. Conf. on Intelligent Control Systems Engineering, Vol.3, No.1, pp. 16-29, 2009. S. Kim, M. Spenko, S. Trujillo, B. Heyneman, V. Mattoli, and M. R. Cutkosky, “Whole body adhesion: hierarchical, directional and distributed control of adhesive forces for a climbing robot,” 2007 IEEE Int. Conf. on Robotics and Automation, pp. 1268-1273, 2007.